Merry Xmas Everybody is a single from the British gothic rock band The Mission, released under their side project The Metal Gurus by Mercury on 26 November 1990. It reached No. 55 in the UK and remained in the charts for two weeks. A cover of Slade's 1973 hit, it written by Noddy Holder and Jim Lea, with the Metal Guru's version produced by Holder and Lea too. In late 1989, the gothic rock band The Mission formed The Metal Gurus as a glam rock tribute band, playing some support dates for The Wonder Stuff. During their performances, the band would play "Merry Xmas Everybody" and "Mama Weer All Crazee Now". 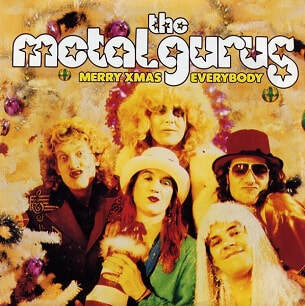 Towards late 1990, the Metal Gurus project was revived again when the band approached Noddy Holder and Jim Lea to produce four tracks, including a version of "Merry Xmas Everybody". Released in November 1990, all artist royalties from the single was donated to Childline. Despite its charitable intentions, the single only reached No. 55 in the UK. It had gained strong airplay on local radio stations across the UK, but received limited airplay on BBC Radio 1. "Merry Xmas Everybody" was released on 7" and 12" vinyl, CD and cassette by Mercury in the UK and across Europe. The B-side of the 7" vinyl was "Metal Guru", a cover of T. Rex's 1972 hit, written by Marc Bolan. The 12" vinyl, CD and cassette editions of the single featured an additional two tracks; versions of Slade's 1972 hits "Mama Weer All Crazee Now" and "Gudbuy T'Jane". "Gudbuy T'Jane" featured Holder on lead vocals. A music video was filmed to promote the single. It featured both Holder and Lea. The single was one of the featured singles on the music panel show Juke Box Jury on 25 November. It was voted a hit. On 30 November, the band appeared with Holder on the James Whale Show to perform "Merry Xmas Everybody". On 14 December, the band also made an appearance on Top of the Pops, again with Holder. Noddy Holder - lead vocals on "Gud Buy T'Jane"